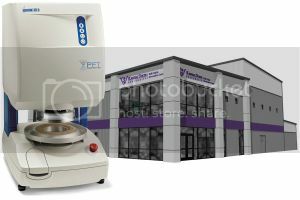 Brookfield Engineering has donated a Powder Flow Tester (PFT) to the new Kansas State University (KSU) Bulk Solids Innovation Center. This new facility at KSU will be used to study and develop the understanding of bulk solids materials handling, enhancing businesses that use these materials or manufacture the systems that convey, store and dispense them. The 13,000ft² centre features five research laboratories and lecture rooms for hands-on training, education and conferences. This university-level research center is the only one of its kind in North America. Brookfield’s Powder Flow Tester delivers affordable testing for powder flow behaviour in gravity discharge from a bin. The PFT provides quick and easy analysis of design parameters for industrial processing equipment. It is ideal for manufacturers who process powders daily and want to minimise or eliminate the downtime and expense that occur when hoppers fail to discharge. Customers can use the PFT to perform QC checks on incoming materials, quickly characterise new formulations for flowability and adjust composition to match the flow behaviour of established products. The donation includes the newest version of Powder Flow Pro Software and all accessories for handling powder samples. Brookfield will also provide the Small Volume Shear Cell, which requires 43cc of powder for formulators who test expensive powders in limited quantities or materials that are difficult or messy to handle.